Ahead of the All-Ireland football final between Tyrone and Dublin, we spoke to some current players to find out who they think will claim the Sam Maguire. The jury have delivered their verdicts and all four are going for Dublin. Do you expect Mickey Harte to have a tactical trick up his sleeve? Mickey Harte had the majority of us fooled, including Monaghan, in the semi-final with his strategy to push up on kick-outs and press Monaghan high. Although Monaghan dominated their kick-outs I was impressed by Tyrone changing and adapting to the game plan. So I fully expect something different from Tyrone especially from the All-Ireland semi last year. Also I believe Mickey will have learned plenty from Super 8s game in Omagh. What will the key match-up be? There will be many key match-ups throughout the game. I believe Dublin got a lot of these match-ups spot on in Omagh earlier in the year. I think Padraig Hampsey will be detailed to mark Ciarán Kilkenny. The winner of this match-up may have a big bearing on this match. Previous finals have not delivered vintage Dublin performances, do you expect one this year? Who is your favourite for footballer of the year? I believe Brian Fenton is currently favourite for footballer of the year. He makes Dublin tick in both defence and attack. Colm Cavanagh is not far behind. Is Colm Cavanagh: wasted as a sweeper against Dublin? Colm Cavanagh is crucial for Tyrone as the sweeper and plays it perfectly. I think he has a huge influence on games both attack and mainly defence delivering crucial turnovers. He is a vital cog for this Tyrone team. I believe that Dublin will have a game plan to counter this and may punish if given to much freedom. Are Dublin missing Diarmuid Connolly? Any team would miss a player of Diarmuid's caliber, but until Dublin are beaten it's impossible to judge. He made a massive contribution to last year's final and if close again this year how much will they miss him? Time will tell. For me it’s Dublin's to lose. They look like a team ready to hit top gear and they are building nicely. Tyrone must go for this and take risks and hope it will be enough. Dublin’s bench should finish the job and take four-in-a-row. He is going to have to come up with something special, something no manager has done in championship against Dublin in four-years. He has to have a plan to stop Ciarán Kilkenny dictating the games like he does and I can see him trying something to stop Dublin winning their kick-outs so easily. They do that game-in-game-out because they are so hard to overturn when in possession of the ball. Winning and competing for kick-outs will be major role in this game. Peter Harte and John Small. Peter Harte is a huge player for Tyrone. If he is on the ball and having an influence on the game Tyrone will be dangerous as he is a really intelligent player and if given time and space to pick passes he could cause Dublin problems. Jim Gavin will be well aware of this threat and will have their best marker on him to try shut him down which I think will be John Small. They had a really physical battle last year and will be interesting to see that again one year later. I don’t expect a classic unfortunately to be honest. I think Tyrone won't want it to be a shootout or a high scoring game. They will look to get bodies behind the ball, try frustrate Dublin and then counter attack similar to what they did to Monaghan and other teams this year. So I don’t expect to see Dublin playing fast , expansive, free flowing football but they won’t mind that either and are well capable of wining dirty and playing it physical and winning closes games. Conor McManus, he is a class player who always delivers for Monaghan with ridiculous scores from play and dead balls. Is Colm Cavanagh wasted as a sweeper against Dublin? I don’t think he is wasted as a sweeper as he plays a key role for Tyrone when the opposition are attacking and makes it really difficult to get balls into the full forward line, in around the scoring zone. What he has been doing recently which he will have to do again Sunday is to be a threat going forward and getting onto the end of moves like he did against Monaghan. Imagine the lift it would give Tyrone if he picked off 2 or 3 points for play. Up until now you would have to say no as they are in another All-Ireland final but you never know come 4.30 on Sunday we might be saying something very different because we know what he can offer. Dublin simply because they have more scorers on the first 15 and also have more of a scoring threat to come off the bench. Scores wins games. I think so. He has shown in the past he is not afraid to make big decisions in All-Ireland finals. Bringing Peter Canavan off and back on in 2003 and putting the McMahon brothers in the full-back line in 2008 being the obvious ones. I expect Mickey Harte to have something planned on Sunday, that we have not seen this year. A lot of people will say Padraig Hampsey versus Ciarán Kilkenny but I think that if Tyrone are to win they need Conor McAliskey to have the game of his life. I think the Dublin defender man marking him is most likely Philly McMahon, I think it could be the difference of winning and losing for Tyrone. Dublin have so many marquee forwards that they can afford to have one or two players not playing their best but in my opinion McAliskey needs to have a big game to give Tyrone a fighting chance. In those finals Mayo have shown the country how to play Dublin. If Tyrone adapt something similar to last year's semi-final I can only see one result. To make life uncomfortable for Dublin, Tyrone have to look at how Mayo have played them down through the years. This will require Tyrone going man-to-man and becoming much more adventurous as a team. They have the players to do it but their problem is that they have not played that way all year. Brian Fenton. He is undoubtedly the top midfielder in the country and this year he has added long range shooting to his game too. He is so dominant and never gives the ball away. For a guy that's so tall his touch and skills are very impressive. I think if he has a good game on Sunday and Dublin win, nobody would argue if Fenton got POTY. Potentially, yes. Dublin have played many games where they face sweepers and it has been no issue for them. I think Tyrone could do a lot worse then pushing Cavanagh onto Fenton. If Dublin do like last year and play from the wings Cavanagh's role in front of the full-back line maybe diminished. They are showing no signs of it. It's a credit to the Dublin team and management that they can lose a player of Diarmuid Connolly's ability and keep on winning games by large margins. On Sunday he would be a great addition with his strength and ability to break the gain line but as of now Dublin have coped very well without him. Dublin. They have vital experience picked up from being in 5 All Ireland finals this decade and winning them all. I think Tyrone will put it up to them for a large portion of the game but when it gets to the 45-55 minutes you will see Dublin empty the bench. When you have the likes of cormac Costello, Paul Flynn and Kevin McManamon coming off the bench it's a huge confidence booster. The bench has been important to Dublin in the tight games and Sunday will be no different. Dublin by 5. I think Mickey will stick to the game plan he has developed over the last number of years. He has significantly strengthened his bench and those players are making an impact late on in games. This makes them well equipped to match the energy and scoring threat of the Dublin substitutes. Both managers have developed a culture of the '21 man team' and certain players have specialised roles late on in games. 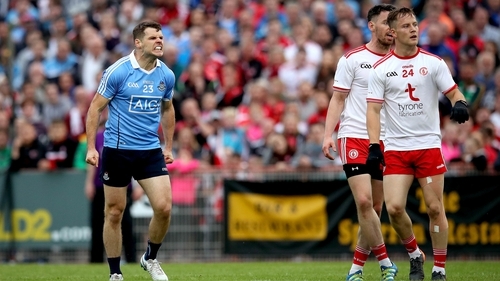 There will be a number of key match-ups, both Dublin and Tyrone are usually good at this. I expect John Small to mark Peter Harte as his strong running and ability to overlap can be a game changer for Tyrone. This Dublin team have delivered very effective performances to win those All-Ireland finals. They have adapted to the opposition and overcome every obstacle. A number of their players have played five finals and won five finals. It's about getting over the line and Dublin know that better than anyone. James McCarthy, he consistently turns in an 8/10 performance every day and sometimes higher! No I don't think so. Tyrone will need his leadership qualities and communication skills to shut down Dublin's space and reduce goal chances. This question has not been asked by any of the teams Dublin have played so far, with the exception of Tyrone in the Super 8's. If this game is tight in the last 10-minutes, Dublin will definitely miss Connolly's ability to change the game. He was instrumental as a second-half substitute in last year's final and won the free for Dean Rock to kick the winner! Everyone is tipping Dublin for this game and it is hard to argue with that given their dominance under Jim Gavin. Tyrone can win the game and over the last three weeks their players will have enjoyed the experience of Mickey Harte, Gavin Devlin and Stephen O'Neill who have all been part of Tyrone's All-Ireland successes. The group will have grown immensely from their Super 8s clash with Dublin in Omagh and if they prevent a Dublin goal they have a chance! Dublin.